A unique and practical pitcher-shaped base is embellished with sweet embroidery and easy crocheted details. Finished Size: 12¾“ circumference and 9” high. Tahki Donegal Tweed (100% wool; 183 yd [167 m]/100 g): #850 charcoal (MC), 1 skein. S. Charles Collezione Trapper (70% merino, 30% cashmere; 192 yd [176 m]/50 g): #507438 blue/yellow tweed, #507456 red tweed, #507458 hot pink/orange tweed, #507432 yellow/lime tweed, 1 skein each. Yarns distributed by Tahki Stacy Charles. Needles: Sizes 4 (3.5 mm) and 5 (3.75 mm): set of 4 or 5 double-pointed (dpn). Adjust needle size if necessary to obtain the correct gauge. Notions: Markers (m); size F/5 (3.75 mm) crochet hook; tracing paper; pencil; straight pins; crewel needle; tweezers (optional); 4 1⁄8” diameter plastic canvas round. Additional Gauge: 24 sts and 40 rnds = 4” in St st with MC on smaller needles. 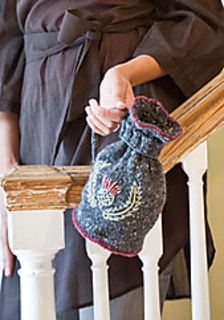 The yarns are knitted at a relatively tight gauge to create a sturdy fabric so that the bag holds its shape and is easier to embroider. The pitcher can be closed by sliding the ribbed ring up the handle and over the ribbing at the top of the pitcher. For tips on embroidering knitted fabrics, see Beyond the Basics (page 18).